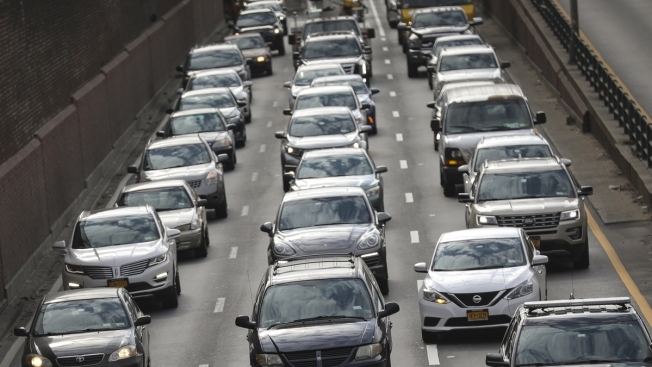 This Nov. 20, 2018, file photo shows heavy traffic on the Brooklyn-Queens Expressway in Brooklyn, New York. As auto loan debt has soared, so has the number of people who can't pay, with the level of serious delinquencies breaking past the heights reached just after the financial crisis. More than 7 million Americans are 90 days or more behind on their vehicle loans as of the end of 2018, according to data released Tuesday by the New York Federal Reserve. That's more than 1 million higher than the peak in 2010 as the country was recovering from its worst downturn since the Great Depression. "The substantial and growing number of distressed borrowers suggests that not all Americans have benefited from the strong labor market and warrants continued monitoring and analysis of this sector," Fed economists said in a report that accompanied their quarterly look at U.S. consumer debt. The surge in delinquencies came along with a $584 billion jump in total auto loan debt, the highest increase since the New York Fed began keeping track 19 years ago. On the bright side, the overall level of overall credit quality actually improved, with those at the lower end of the spectrum declining to 22 percent of the total share while 30 percent of the $1.27 trillion in total auto debt is now held by those on the higher end of the scale. Those numbers "would suggest that the overall auto loan stock is the highest quality that we have observed since our data began in 2000. However, with growth in auto loan participation, there are now more subprime auto loan borrowers than ever, and thus a larger group of borrowers at high risk of delinquency," the report said. Debt issued by auto finance companies, rather than at the dealer level, is responsible for most of the growth by less-qualified borrowers. Of the total auto finance debt, 6.5 percent was past due in the fourth quarter. The flow of debt that slipped into the 90-day past due category edged up to 2.4 percent in 2018, compared with a low of 1.5 percent in 2012. Overall, household debt rose by $32 billion, or 0.2 percent, to $13.54 trillion in the fourth quarter. That's $869 billion higher than the crisis peak of $12.68 trillion and is 21.4 percent above the post-crisis low point in the second quarter of 2013. Student loan debt edged higher to $1.46 trillion while credit card balances rose to $870 billion, right around their crisis peak. Generally, though, Americans were less hungry for debt than in the past: Credit inquiries fell to their lowest level in the history of the Fed survey, driven largely by a decline in refinancing requests.